Want to go to the Desolation of Smaug Premiere? Are you the world’s biggest Hobbit fan? 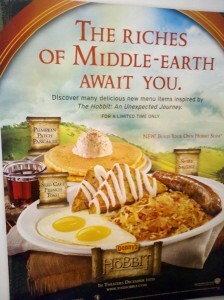 Last year, you may remember that Denny’s had a Hobbit menu in their restaurants during the holiday season. Today we can reveal that they’re doing it again this year, with an all new menu to be launched close to the film’s release; but the REALLY exciting news is the contest they’ll be launching tomorrow, to celebrate their renewed partnership with Warner Bros. and the Hobbit movies. Denny’s will be hosting ‘The Search for Middle-earth’s Greatest Fan’. This competition will run throughout the month of October, and will be for an AMAZING prize: a two-night trip for two, including flights and hotel, to see the Desolation of Smaug world premiere! That’s right; if you’re deemed Middle-earth’s Greatest Fan, your reward will be that you will get to be in the audience at the world premiere screening of the next Hobbit movie, in December this year. How do you win such an incredible prize? Full details of the competition will be coming tomorrow, when Denny’s make their official launch, but we can let you know that you’ll need to make a video explaining WHY you are the biggest fan. Tomorrow a website will go live, where you can upload such a video; we’ll let you know details, such as how long it should be and any other rules. Denny’s will pick their favourite videos. They will then send those videos along to us here at TORn, where we will pick, from Denny’s favourites, what we think should be the top five. This top five will then be sent to Peter Jackson himself, who will choose his favourite to be the winner. Does it get any better than that? – Peter Jackson himself choosing the lucky winner who will get to join him at the premiere. TORn is excited to be partnering with Denny’s on this. If you read this post last year, you’ll know that we were pleasantly surprised by the care and attention Denny’s gave to their Hobbit menu. This year they’ve been going even further, and have been consulting an ‘Advisory Board’, which includes Senior Staff at TORn, about some of their menu content and giveaway ideas. And of course, we here at TheOneRing.net always love bringing you, dear reader, the chance to win cool stuff – and what could be cooler than this contest? Check back tomorrow morning – after you’ve watched the new Desolation of Smaug trailer – to get all the details on how you could win those tickets to see the world premiere! Smaug is coming! !